22 In whom ye also are builded together for an habitation of God through spirit. First we must know what verse 1 refers to. Below are 2 columns where I have set verses next to each other so we can clearly see the CONTEXT OF THE GATHERING TOGETHER. Please note that this can only refer to the 2nd advent : mighty angels, flaming fire taking vengeance, punished with everlasting destruction, when He shall come to be glorified in His saints. There is no warrant to change 2Thes.2:1 to a PRE -TRIBULATION RAPTURE. The text must be read in it's context; otherwise we have a pretext. We must not read scripture with a doctrinal bias, but let the scripture give it's own meaning. Then we must adopt our views to the doctrine the word of God teaches. Now we will continue from vrs. 5. notice the apostle told them before of these things. Apparently they didn't get it. So he says in vrs. 6 that now after I explained it again, you understand what is holding back the antichrist that he might be revealed in his time. In vrs. 7 Paul says some one ( he ) is restraining this mystery of lawlessness and that the antichrist cannot be revealed until he is removed. Who is this? Many have read that it is the Holy Spirit. But it does not say HOLY SPIRIT. IT IS THE FALLING AWAY FROM THE FAITH. I am challenging the doctrine of the Pre-Trib Rapture theory. In my studies I cannot find scripture that proves the Lord Jesus Christ's coming is imminent ( at any moment ). To many it seems like it doesn't matter as long as He comes back. Some saints say I am a pan- triber: that means which ever way it pans out. To others it is a secondary issue because it does not affect our salvation. Is this actually true? Let us search the scriptures for our answer. First the word of God tells us to handle the word accurately; rightly dividing. The apostle then names 2 men who erred teaching that the resurrection is past already there by overthrowing the faith of some. What could they possibly mean by the resurrection is past(already taken place )? What if there is no pre-trib rapture and the antichrist appears with his false prophet who starts enforcing the mark of the beast? Rev.13. Some of the saints who were taught the any time fly away from the coming trials of the tribulation with it's suffering and martyrdom, will come to the conclusion that they missed the rapture. They are left behind! Therefore I conclude that what you believe and teach others as to the timing of the RESURRECTION / RAPTURE does affect one's salvation. To overthrow someone's faith is serious business and you will not be found guiltless. καταστρώννυμι katastrṓnnymi, kat-as-trone'-noo-mee; kata, "down," strophe, "a turning;" Eng., "catastrophe"
I ( WRITE YOUR NAME ) BEFORE GOD THE FATHER AND HIS SON THE LORD JESUS CHRIST HAVE NO DOUBT THAT THE COMING OF THE LORD JESUS CHRIST FOR HIS CHURCH IS IMMINENT. I WILL TAKE FULL RESPONSIBILITY FOR ANY SOUL ENDING UP IN HELLFIRE DUE TO MY TEACHING ON THE PRE-TRIB RAPTURE. LET THEIR BLOOD BE UPON MY HEAD AND MY CHILDREN'S HEAD FOR ETERNITY. SIGNED THIS DAY (sign your name) date it. As a tree cannot bear fruit on it's branches without water, sun, nourishment, so therefore you must glean, nourish, drink, eat of My tree says the Lord. My body is food indeed and My blood is drink. When you eat of My flesh this means you are digesting it into your blood / Spirit; the word of authority. When you drink of My blood this means you are acting in the authority of My blood which is shed for the remission of sins for many. This New Covenant of the Lord's supper is given you to act upon in your churches. Many do not understand the meaning of the Lord's supper. It has been relegated to a dead tradition rather than a LIVING SACRIFICE. Ye are the living sacrifice, for you are given sufferings to endure in My name. The bread and the wine / grape juice must be at least once a week when saints meet for worship. I the Lord am there in their presence. What gives the bread and wine it's efficacious grace and power in your lives is My presence received by faith as you partake of MY BROKEN BODY AND SHED BLOOD. THIS IS WHY MANY ARE SICK, WEAK AMONG MY PEOPLE, AND SOME SLEEP (have died ). It is not just that they are practicing sin and partaking of the Lord's table, but that they are ignorant of it's meaning. Why would I the Lord institute this ordinance if it were not to the health and well being of My people? This is not a superstitious religious ritual, but power, healing deliverance in My name to them that partake faithfully in obedience of My Body and Blood. As Abraham was circumcised for a seal of the righteousness he obtained by faith, so eating and drinking the Lord's supper (by faith) is a seal of the righteousness of Christ in your lives. This is not sacrificing the Lord over and over every week as some who practice the mass (Heb. 6:4-6), But a LIVING UNION YOU ARE PRIVILEGED TO PARTAKE IN. This ordinance gives strength and health both spiritually and physically in the churches, even My body, the Body of Christ. The Lord's table is an outward expression of the LIVING RESURRECTED Christ in your lives. This is what gives power, authority for healing, miracles in My churches among the saints. The Lord gives permission to do the Lord's supper in your homes if the church forbids this ordinance or does it in a mechanical way ( out of tradition ).The man of the house will institute the living sacrifice of bread and wine / grape juice. You may use grape juice instead of real wine. Always use the principle of Rom. 14 and 1 Cor. 8 not to cause someone to stumble, for in wounding their conscience you wound Christ. Always give the meaning of the Living sacrifice when partaking for I AM the God of the living, I live forever more never to be sacrificed again. Once for all in the beginning of My ministry I the Lord put away sin forever for them that trust and obey my commandments. This is the same bread and wine our father Abraham partook with Melchisedec, King of Salem ( Jerusalem ). The Lord also wants us to understand that healing is in the ATONEMENT. Therefore brake the bread, which is the broken body of the Lord Jesus Christ. Believe and understand that as he was broken to forgive your sins, impute to you His righteousness, so must you be broken to live in His power and authority. The Lord must increase and I must decrease. When ye drink the cup of the fruit of the vine, believe, understand that as His blood was shed ( for the life is in the blood ), so you will glorify the Lord in your sufferings and death. Give unto Me the righteous due as King of the Universe. There are some in My churches that have not this worship or knowledge. I AM the Prince of the earth who is to come to reign very soon. Antichrist with all of his forces is now bringing about the greatest deception upon the face of the earth. Tell the righteous ones in congress, senate, house, judiciary that prosecution must be swift against treason. They that have done this evil need to be executed / imprisoned according to Military Tribunals. Laws must be past to stop them in media / entertainment from speaking and putting on shows of President Trump (Or any president) being beheaded, stabbed to death, shot in the head and all the wickedness they portray. They will say it is free speech, their right of free artistic expression. It is an evil that cannot be permitted. True freedom and it's expression does right, morally good for the Nation. This evil is for the destruction of every right, good moral law. They will not quit, nor give up this rebellion for they are the seed of evil children raised up for this time of : THE MYSTERY OF INIQUITY. 7 For the mystery of iniquity doth already work: only he who now letteth will let, ( hinder, restrain ) until he be taken out of the way. 8 And then shall that Wicked be revealed, whom the Lord shall consume with the spirit of his mouth, and shall destroy with the brightness of his coming: 9 Even him, whose coming is after the working of Satan with all power and signs and lying wonders, 10 And with all deceivableness of unrighteousness in them that perish; because they received not the love of the truth, that they might be saved. 11 And for this cause God shall send them strong delusion, that they should believe a lie: 12 That they all might be damned who believed not the truth, but had pleasure in unrighteousness. 13 But we are bound to give thanks alway to God for you, brethren beloved of the Lord, because God hath from the beginning chosen you to salvation through sanctification of the Spirit and belief of the truth: 14 Whereunto he called you by our gospel, to the obtaining of the glory of our Lord Jesus Christ. 15 Therefore, brethren, stand fast, and hold the traditions which ye have been taught, whether by word, or our epistle. 16 Now our Lord Jesus Christ himself, and God, even our Father, which hath loved us, and hath given us everlasting consolation and good hope through grace, 17 Comfort your hearts, and stablish you in every good word and work. The more they are exposed, the more they will lie to the American public to hide their hideous deeds. When My people awaken to their plans of world conquest, their Luciferian roots, child sacrifice, pedophilia, and a host of other sick perversions, then I the LORD will hear their prayers to heal the Nation. 12 And the LORD appeared to Solomon by night, and said unto him, I have heard thy prayer, and have chosen this place to myself for an house of sacrifice. 13 If I shut up heaven that there be no rain, or if I command the locusts to devour the land, or if I send pestilence among my people; 14 If my people, which are called by my name, shall humble themselves, and pray, and seek my face, and turn from their wicked ways; then will I hear from heaven, and will forgive their sin, and will heal their land. 15 Now mine eyes shall be open, and mine ears attent unto the prayer that is made in this place. 16 For now have I chosen and sanctified this house, that my name may be there for ever: and mine eyes and mine heart shall be there perpetually. But if My people do not seek My face and ignore these CRIMES AGAINST NATURE, AGAINST MANKIND, AGAINST THEM THAT DWELL IN HEAVEN : THEN I THE LORD WILL BRING NUCLEAR WAR, DESTRUCTION TO AMERICA. 13 Put ye in the sickle, for the harvest is ripe: come, get you down; for the press is full, the fats overflow; for their wickedness is great. 14 Multitudes, multitudes in the valley of decision: for the day of the LORD is near in the valley of decision. 15 The sun and the moon shall be darkened, and the stars shall withdraw their shining. 16 The LORD also shall roar out of Zion, and utter his voice from Jerusalem; and the heavens and the earth shall shake: but the LORD will be the hope of his people, and the strength of the children of Israel. You are now in the time space of decision. Will My church serve the Living God, or will they keep silent for their own protection? For I tell you My people as you stand for righteousness against these cursed children you will suffer much. But My suffering is sweet, even the Fellowship of My Suffering I share with My faithful ones who will be martyred. They will reign with the LORD in His throne. The time is here. Decide whom will you serve. For there is no neutrality in My Kingdom. You are either for the Lord or against the Lord. Make up your minds now. For I will comfort My faithful ones even in the midst of great persecution, suffering and affliction. Them that go along with this evil system to save their lives will lose eternal life. 34 Think not that I am come to send peace on earth: I came not to send peace, but a sword. 35 For I am come to set a man at variance against his father, and the daughter against her mother, and the daughter in law against her mother in law. 36 And a man's foes shall be they of his own household. 37 He that loveth father or mother more than me is not worthy of me: and he that loveth son or daughter more than me is not worthy of me. 38 And he that taketh not his cross, and followeth after me, is not worthy of me. 39 He that findeth his life shall lose it: and he that loseth his life for my sake shall find it. Tell them My grace is sufficient to them that trust and obey the Lord your God. Those that turn a blind eye to the abominations done upon the face of the earth will be damned. Even as I destroyed whole families for the man who pretended not to see the children being sacrificed to Molech. SO WILL I DO TO THIS GENERATION. 3 And I will set my face against that man, and will cut him off from among his people; because he hath given of his seed unto Molech, to defile my sanctuary, and to profane my holy name. 4 And if the people of the land do any ways hide their eyes from the man, when he giveth of his seed unto Molech, and kill him not: 5 Then I will set my face against that man, and against his family, and will cut him off, and all that go a whoring after him, to commit whoredom with Molech, from among their people. 6 And the soul that turneth after such as have familiar spirits, and after wizards, to go a whoring after them, I will even set my face against that soul, and will cut him off from among his people. 7 Sanctify yourselves therefore, and be ye holy: for I am the LORD your God. I Am the LORD God Almighty Creator of heaven and earth. Will you dare disobey My commandments and think you have a free pass to enter My glory? You refuse to do right and suffer for My name's sake. You will be brought down to the sides of the pit with them who are fearful ( cowards ) and would rather live in these abominations. Sacrifice your fortunes, homes, treasures, even your own lives for righteousness, or you will not enter the Kingdom of God. The time is now to act. Soon antichrist will appear. I the Lord am with you. Be faithful unto death and you will receive a crown of Righteousness that day for eternity. I the LORD your God have said it. I will perform it to the letter. Pray, seek My face for the time of trouble is coming. The LORD your Deliverer, the Lord Jesus Christ. [Mat 24:3-14 KJV] 3 And as he sat upon the mount of Olives, the disciples came unto him privately, saying, Tell us, when shall these things be? and what [shall be] the sign of thy coming, and of the end of the world? 4 And Jesus answered and said unto them, Take heed that no man deceive you. 5 For many shall come in my name, saying, I am Christ; and shall deceive many. and there shall be famines, and pestilences, and earthquakes, in divers places. 8 All these [are] the beginning of sorrows. 9 Then shall they deliver you up to be afflicted, and shall kill you: and ye shall be hated of all nations for my name's sake. 10 And then shall many be offended, and shall betray one another, and shall hate one another. 11 And many false prophets shall rise, and shall deceive many. 12 And because iniquity shall abound, the love of many shall wax cold. 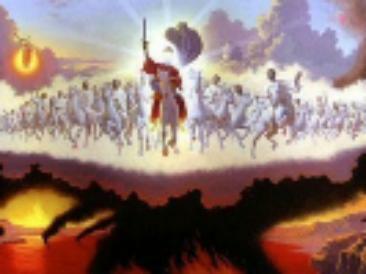 [Rev 6:1-17 KJV] 1 And I saw when the Lamb opened one of the seals, and I heard, as it were the noise of thunder, one of the four beasts saying, Come and see. 2 And I saw, and behold a white horse: and he that sat on him had a bow; and a crown was given unto him: and he went forth conquering, and to conquer. 3 And when he had opened the second seal, I heard the second beast say, Come and see. 4 And there went out another horse [that was] red: and [power] was given to him that sat thereon to take peace from the earth, and that they should kill one another: and there was given unto him a great sword. 5 And when he had opened the third seal, I heard the third beast say, Come and see. And I beheld, and lo a black horse; and he that sat on him had a pair of balances in his hand. 6 And I heard a voice in the midst of the four beasts say, A measure of wheat for a penny, and three measures of barley for a penny; and [see] thou hurt not the oil and the wine. 9 And when he had opened the fifth seal, I saw under the altar the souls of them that were slain for the word of God, and for the testimony which they held: 10 And they cried with a loud voice, saying, How long, O Lord, holy and true, dost thou not judge and avenge our blood on them that dwell on the earth? 11 And white robes were given unto every one of them; and it was said unto them, that they should rest yet for a little season, until their fellowservants also and their brethren, that should be killed as they [were], should be fulfilled.